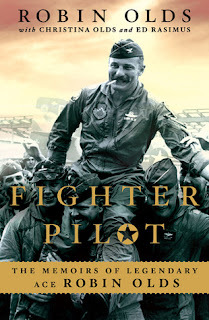 Because I Told You So: Book Report: "Fighter Pilot"
With humbleness, a natural, easygoing voice and unbridled passion, Robin Olds tells his life story as though he were hunkered down over a beer or three at the VFW. His book is filled with spectacular stories of death-defying battles in the skies during World War II and Vietnam. He downplays his exploits rather than embellish them. Despite his heroism, he saw himself as just a regular guy doing his job. Sometimes Olds loses track of the point of his tales by getting mucked up in technical minutiae, but for the most part he keeps his stories soaring. He keeps his guns blazing in the latter half, describing his salty encounters with the dopey military brass about his frustrations over Vietnam rules of engagement that set the operation up to fail. Above all, Olds translates the sheer thrills and fun of his service. He was a vital part of what made the Greatest Generation great.